Romain Fornell was born in Toulouse, France, in 1976. In 1994, he began his studies at the prestigious Toulouse Hospitality School (Lycée des Métiers d’Hôtellerie et du Tourisme) and was named Best Young Chef of the Midi Pyrénées region. Soon after, he began his professional apprenticeship at renowned French restaurants, including Les Jardins de l’Opera. In 1996, he moved to Barcelona to be second-in-command at La Maison du Languedoc Roussillon. He returned to France in 1997 to work first with Michel Sarran and later with Alain Ducasse. In 2000, he opened Chaldette in Lozère, where he showcased his creative potential, and went on to earn his first Michelin star in 2001, making him the youngest chef to do so, just 24 years old. He returned to Barcelona in 2002, where he has lived ever since, to take charge of the restaurant Diana at the Palace Hotel. In 2004, Diana became Caelis, with its own philosophy independent of the hotel where it was located. In 2005, Romain got another Michelin star for Caelis, becoming the only French chef to receive this distinction in both France and Spain. Caelis was named Restaurant of the Year in 2006 by the Catalan Academy of Gastronomy. In 2011, he opened Cafe Emma in the centre of Barcelona with his friend and former mentor Michel Sarran. 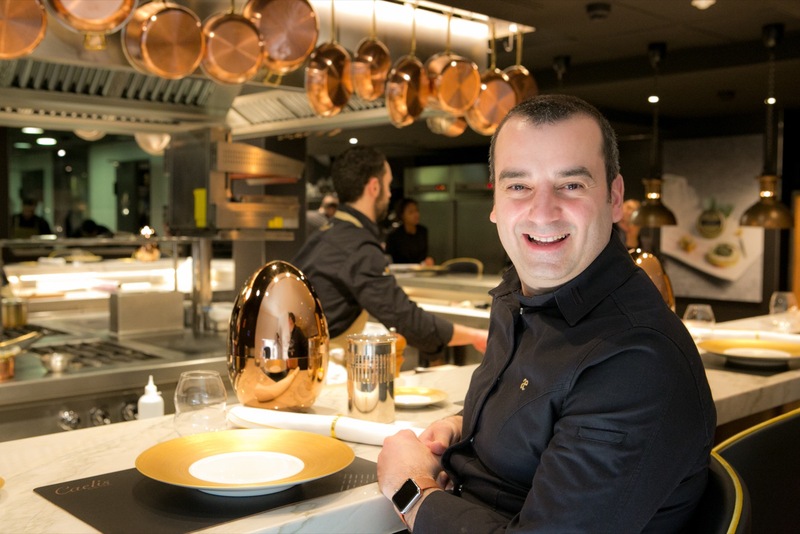 Michel has two Michelin stars for his restaurant of the same name in Toulouse. In recent years, Romain has added Café Turó, Epicerie and Joël’s Oyster Bar, all in Barcelona, to his culinary endeavours. In 2015, he was named culinary director at Hostal de La Gavina in S’Aragó (Costa Brava, Girona) with special emphasis on the Candlelight restaurant, which took his name in 2016 (Candlelight by Romain Fornell). In early 2017, with another partner, Oscar Manresa, he took over management of Casa Leopoldo, an emblematic restaurant dating back to 1936 that they hope to put back on the city’s culinary map. From early 2017, coinciding with the move of Caelis to hotel Ohla Barcelona, he has been the Chef/Culinary Director of all of the culinary spaces at hotel Ohla Barcelona (includes La Plasshola, Vistro49, Rooftop Ohla Barcelona). In March 2018, Romain won the award for the Best Restaurant Chef at the 2008 European Hotel Awards by Références. On October 29, Caelis was awarded “la meilleure table internationale” as part of the 2018 Trophées de la gastronomie held in Lyon. At the beginning of December 2018, Romain and his partner Oscar Manresa opened Casa Tejada, which started a new stage with both of them as a Bistro and Oyster Bar. Throughout his career, Romain has participated in the top culinary events in the world, including among many others the World Gourmet Summit Singapore, World Gourmet Festival Bangkok, Festival Montreal, Rencontre Internationale de la Gastronomie Toulouse, and European Catering Cup in Lyon.